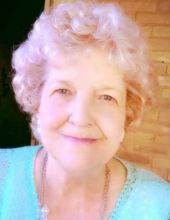 Mary Nell (Granny) Carlile, age 83, passed away on April 3, 2019 in Jacksonville, Texas. Jackson and Dolly Rachel Chandler. She grew up in Mt. Selman, attended high school in Bullard and graduated in 1953. She worked at Doctor’s Memorial Hospital and Rusk State Hospital. What brought her the most joy on this earth was playing 42, cooking, spending time with her family and loving on her grandchildren. She was preceded in death by her father, Harvey Jackson Chandler; mother, Dolly Rachel Chandler; son, Bennie Earl; brother, Harvey Jr.; and two sisters, Annie Lou Martin and Dorothy Grimes. Left to cherish her memories are her beloved brother and sister-in-law, Roger Dale and Margaret Chandler of Gallatin; sons, Jerry Carlile of Mt. Selman, Larry Carlile of Mt. Selman, Gary Carlile and wife Linda of Texarkana; and daughter, Marilyn Roberts and husband Willie of Murchison. She is also survived by 12 grandchildren: Jill Perkins and husband Robert of Tyler, Lynn Carlile and wife Rebecca of Montalba, Paula Chaney and Prince Jackson of Jacksonville, Zac Carlile and Lindsey of Whitehouse, Chad Carlile and wife Amanda of Texarkana, Adam Carlile of Texarkana, Carrie Ham and husband Jake of Tyler, Mark Carlile and wife Brianna of Temple, Matthew Carlile and wife Heather of Texarkana, Megan Richardson and husband Aaron of Jacksonville, Collin Carlile and wife Morgan of Texarkana, Julie Defor and husband Brad of Palestine; and numerous great-grandchildren. A gathering of family and friends will be observed on Thursday evening, April 4, 2019 from 5-7 pm at Autry Funeral Home in Jacksonville, Texas. Funeral Services will be Friday, April 5, 2019 at 10:00 AM at Autry Funeral Home Chapel in Jacksonville. Burial will be in the Still Waters Memorial Gardens in Jacksonville. "Email Address" would like to share the life celebration of Mary Nell Carlile. Click on the "link" to go to share a favorite memory or leave a condolence message for the family.